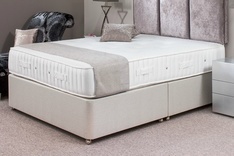 All our 5 ft wide king size divan beds are hand crafted in our workshop to ensure the quality and reliability of our products. 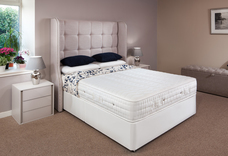 Each of our king size divans can be upholstered in a range of colours and comes with a mixture of generous optional storage options including 2 drawers, 4 drawers, ottoman, half ottoman and jumbo drawer storage and also in a variety of different levels of support. 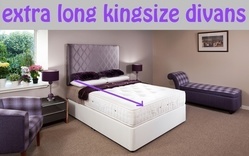 We have carefully put together a selection of king size divans to ensure there is a bed to suit everyone whatever their size, weight, personal preferences and budget including soft, medium, firm, extra firm and hard divan beds to give you the best night's sleep possible. We also have higher level raised bed frames ideal for elderly and tall people and those with disabilities giving easy access in and out of bed without bending too low. 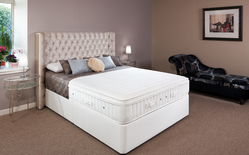 High easy access beds come in all standard bed sizes single, double, superking, emperor and euroking and in any custom size you wish. We also make a wide range of upholstered and padded headboards to match our kingsize divans to complete your bed. 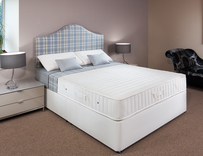 If you have the space a 5ft wide kingsize divan bed is great to give two people that bit more space in bed and prevent roll together by using a quality mattress and well sprung divan bed base. 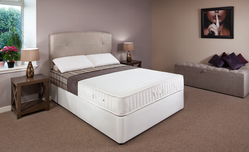 The quality of the bed base adds to the comfort and support of the bed and we have kingsize divans suitable for light or heavy people. 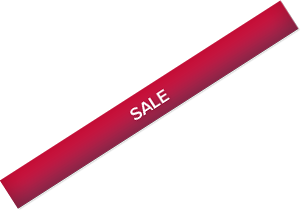 As we also supply interior designers, the rental market and the hotel trade you can be sure of the quality and reliability of our products. 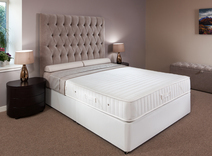 Visit our Glasgow showroom to see our range as we are sure we will have a bed suitable for you. 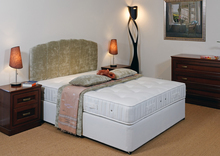 All divan beds can be delivered UK wide. We deliver throughout the UK including to London, Edinburgh, Manchester, Birmingham, Liverpool, Newcastle, Cardiff, Glasgow, Aberdeen, Brighton, Kent, Surrey, East & West Sussex, Lincolnshire, Nottinghamshire, Leicestershire, Derbyshire, Yorkshire, Suffolk, Hertfordshire, Bedford, Buckinghamshire, Berkshire, Oxfordshire, Cambridgeshire, County Durham, Wiltshire, Hampshire, the Isle of Wight, Somerset, Dorset, Devon & Cornwall, Gloucestershire, Cheshire, Shropshire, the Midlands, Norfolk & East Anglia, all parts of Wales, Strathclyde, Argyll & Bute, Perthshire, Dundee and the Highlands of Scotland. We can also ship to mainland Europe.